Rome in one day tour – Rome Highlights one day tour, One day Rome city tours, Visit the best of Rome in one day city tour, Rome in one day guided tour, Rome in a day sightseeing tour. Highlights one day tour in Rome Rome 1 day. Rome in one day – SKIP THE LINE TOURS!!! Rome in one day tour, suitable for children. Privileged entrances. No waiting in line! Rome in one day tour – Rome Highlights one day tour – Departure from your hotel, airport or elsewhere in Rome with your private city-guide and start your tour visiting Capitoline Hill to enjoy the spectacular panoramic view, of the Roman Forum, ancient Temples, Triumphal-archers, the Senate House, Basilicas and Sacred Way, which surround the old Roman Forum, hub of political, religious and commercial life during republican and imperial days and now forming one of the most historical archaeological complexes in the western world. With our Rome in one day tour, visit the nearby elegant renaissance square modelled by Michelangelo for Pope Paul III and adorned by the bronze equestrian statue of Marcus Aurelius, father of the infamous Emperor-gladiator Commodus. See the Circus Maximus of Ben Hur fame with its impressive views of the sprawling ruins of the Emperors’ Palaces on Palatine Hill. Then the Rome in one day tour – Rome Highlights one day tour continues to visit the Coliseum and hear about the bloody gladiator combats, the wild animal games and astonishing events held there to satiate the 70.000 excited roman spectators. Circle around Piazza Venezia, dominated by the massive looming “Wedding Cake” marble honorary monument erected in 1885 to commemorate King Victor Emmanuel II and drive to the Quirinal Palace, official residence of the Italian President originally built by Popes in the 1580’s as their splendid summer residence . Descend to the cascading waters of the Trevi Fountain, the grandest of Rome’s baroque fountains, still fed by an ancient 19 BC roman aqueduct and toss a coin into its gushing sprays to propitiate a sure return-visit to the Eternal City. Stroll by the Spanish Steps, favorite spot of European nobles during the Grand Tour era as well as haunt of poets, writers and painters in the Romantic age. Pass Palazzo Chigi, seat of the government and the nearby Italian Parliament as you make your way to Piazza Navona, most loved meeting place of Romans today and embellished by Bernini’s fountains and the Pamphily Palace. After an inside visit to the awe inspiring Pantheon constructed by Emperor Hadrian in 120 BC, spanned by a solid concrete dome, the largest in the world, enjoy a light lunch or snack in one of the numerous cafés or bars in the picturesque and operatic square facing the monument. The Rome in one day tour – Rome Highlights one day tour continues subsequently cross the River Tiber to the Vatican City, smallest sovereign state in the world, to visit the immense Papal art collections housed in the Vatican Museums once part of the Papal Palaces and the Sistine Chapel. After admiring the numerous artworks and masterpieces of Raphael and Michelangelo, visit St. Peter’s Basilica and the great baroque Colonnaded Square protected by Swiss Guards. At the end of your extraordinary full-day discovery of Rome be accompanied back to your indicated point in Rome or Fiumicino airport. 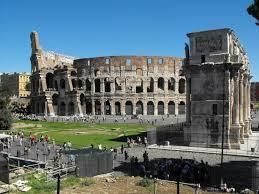 After Rome in one day tour – Rome Highlights one day tour return to your hotel or other agreed spot, end of tour. Rome in one day tour itinerary can be modified according to customer needs!!! We are able to offer Rome in one day tour in a wide range of languages, should you wish to book a tour in a specific language (apart from English and Italian) please follow the relevant link below. Rates per person include the above walking/driven tour plus air-conditioned Limousine, minivan or other means of transport, personal tour guide, driver, tax. Tour of Rome in one day available only in limousine, minivan or other means of transport. Rome in one day tour available only in limousine or minivan or other means of transport. Rome in one day tour suitable for children, for disables if with wheelchair on request.